After leaving Nenagh, we traveled through Thurles on the way to Tubrid and decided to stop and get something to eat since we hadn’t had lunch and it was getting late in the afternoon. In 1967 you couldn’t find a hamburger or pizza anywhere in Ireland. These were the staple foods of youngsters growing up in the U.S., but they hadn’t yet been discovered in Ireland. Instead, fast food in Ireland consisted of fish and chips soaked in vinegar and served in a basket lined with newspaper. I hadn’t acquired a taste for the fish and chips at the time, so I was out of luck. I was also a picky eater at that age, an affliction which my waistline will attest that I have since outgrown. So we decided to have the fish and chips, even though pizza and hamburgers were available. Hamburgers and pizza can be found virtually anywhere in Ireland now, much to the relief of young visitors from the U.S….and no doubt their parents too. Upon arriving at Tubrid House, we met my cousin Theresa and had a drink on the patio along with some of her Irish friends. We were scheduled to have dinner at the Cradog in a short while along with some Americans who were staying there as part of their bus tour. We’d be having a traditional Irish dinner of bacon and cabbage, a curious combination, we thought. However, it wasn’t like the bacon you have in the U.S., or even in Canada, but instead was more like thinly sliced pork. The cabbage was chopped and lightly cooked so it was still a little crisp. The meal was excellent. We had a great time talking with the fellow Americans and it brought back memories of our Scotland/Ireland bus tour in 2003. On a bus tour it’s easy to get overwhelmed because you’re experiencing so many things so quickly. There’s nothing like having your own driver and tour guide to keep you moving at a fast pace. The days run together and you really have to think about where you were on each day to keep it all from getting mixed up. On Monday we decided to drive to Waterford to visit the famous crystal factory and then to Tramore to visit the seaside resort where I spent a week during my first visit to Ireland. When we arrived at the Waterford factory we took a tour to see the methods used to make the crystal. 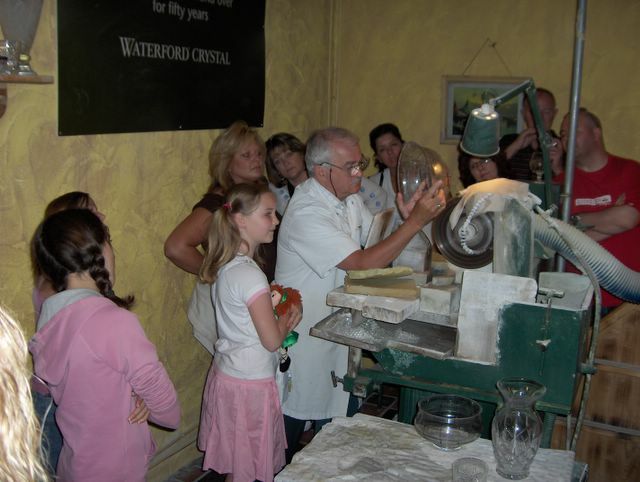 The Waterford Crystal company was formed in 1783 by the Penrose brothers and operated for about 70 years before closing its doors due to high taxation. Almost 100 years later, in 1947, the company was revived and now has a reputation for producing some of the finest crystal in the world. It was fascinating to watch all the steps involved, especially the intricate cutting of the patterns by hand into the glass. We purchased some crystal and had it shipped to the U.S. because we didn’t want to carry it with us in Europe because it’s quite heavy and also because it could have easily been broken in our luggage. 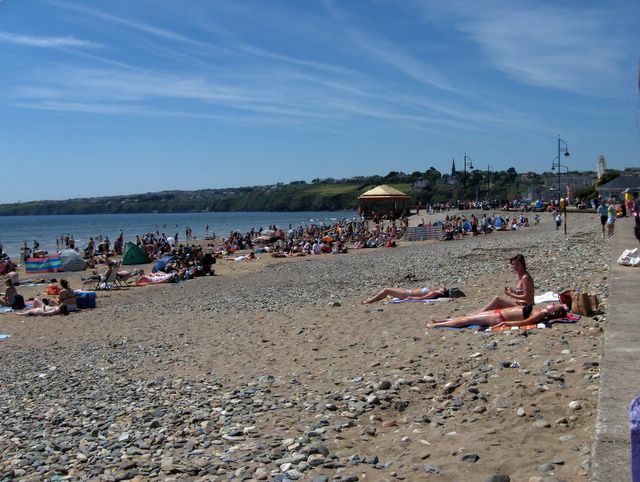 Next we visited Tramore, which is just a short drive from Waterford. Tramore is a pleasant seaside resort on Ireland’s east coast. I can recall when I was a child having my first experience with slot machines at Tramore, which at the time took pennies. I’m not sure it was even legal for a 7-year-old to gamble, but no one stopped me and it was great fun. I also recall the amusement rides, especially bumper cars that had no rules. Head-on collisions were allowed and were violent enough to nearly eject me from the bumper car! In the U.S. amusement parks, the bumper cars had to travel in a circle in one direction, so I never knew what it was like to have a head-on collision. After experiencing a few, I saw the reasoning behind having the restriction of keeping everyone moving in the same direction. Tramore seemed much larger and more crowded than I recall, probably because 40 years ago it wasn’t practical to visit for just a day. Now with better highways and many more cars, I’m sure that a lot of the people on the beach were just there for the day. This assumption was also based on the difficulty of finding a parking place. We walked down the beach and around the town and enjoyed the beautiful weather. Later we headed back to Tubrid and had some traditional Irish stew that Theresa had prepared for dinner. We then went to the Killahy cemetery and took some pictures of headstones in an effort to see if we could track down any genealogical data related to my mother’s family. 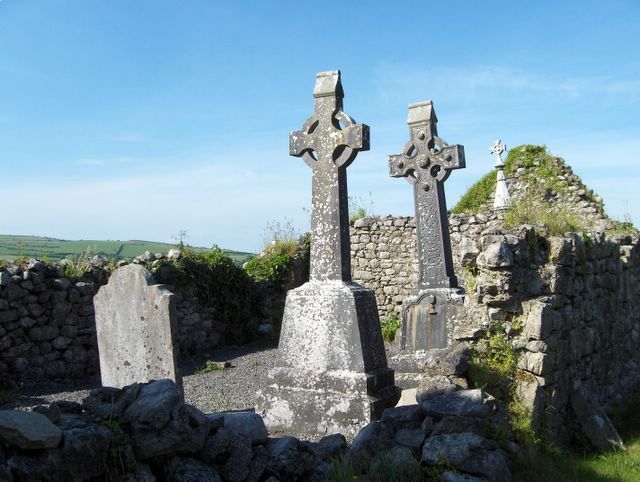 It’s believed that my mother’s grandfather, John Kennedy, came from Knocknamuck, Tullaroan before settling in Tubrid. The Killahy cemetery had many headstones with Kennedy names and we took photos of them to see if we could figure out who was related to whom. Unfortunately it was getting late in the day and getting good pictures was a little difficult. Many of the headstones were badly weathered, so we weren’t really able to get much useful information. After reading the headstones, we found a lot of Columb Kennedys must have lived around that area in the 1800’s. My great-great uncle Columb Kennedy is the man credited with building Tubrid House and subsequently willed it to my great-grandfather, John Kennedy. It was subsequently passed down to his son, my grandfather, Patrick Kennedy, then to his son, John Kennedy, my uncle. The house is now owned by my cousin Paddy and his wife Theresa. We did find a Mrs. Columb Kennedy buried in Killahy cemetery who died August 9th 1872, at age 66 who was from Tubrid. However, my cousins are quite sure that the Columb Kennedy who built Tubrid House never married and is buried in a cemetery in Kilkenny. This entry was posted in travel by Lee Devlin. Bookmark the permalink. I’m a relative of the Knocknamuck Kennedy family too.